The day started out a little rocky. I was supposed to be at Becky's in Redondo Beach at 10, but I woke up at 9:12, not sure why my alarm didn't go off at 8 like it was supposed to. I think I made pretty good time, all things considered. 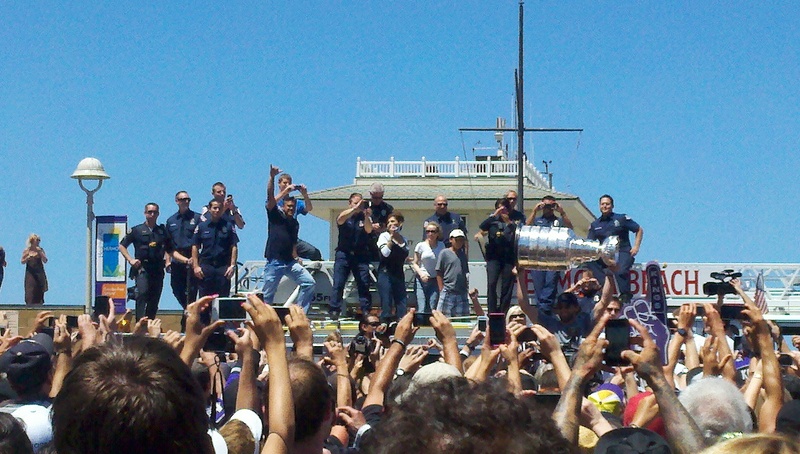 We made it to the Hermosa Beach pier just in time for the Kings rally. It was kind of surreal: a pep rally for a hockey team...at the beach. 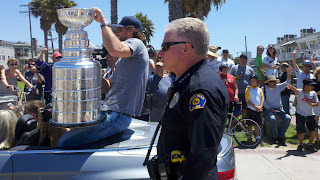 I guess most of the Kings' players live down there, so the Hermosa Beach chamber of commerce arranged an opportunity to show off the Stanley Cup. It was short and sweet, and they talked more about the chamber of commerce than hockey, but the the cup was there in all its glory, held aloft by a very nice-looking Canadian. The rally broke up, and they conveyed the cup in a convertible right up the Strand. That's where we got the best look. Having beheld the cup, we headed to Uncle Bill's Pancake House in Manhattan Beach. I wasn't all that impressed with the menu, but the avocado was ripe and buttery and the hash browns were to die for. They were nice and crispy, and tasted like they might have been fried in coconut oil. They were so good, I didn't even mind that my poached eggs were pretty much hard-boiled. Now Becky knows pretty much everyone in the South Bay, so as we browsed around after breakfast, she chatted with people about the cup, and found out that her friend had actually gotten her picture with it the night before at a local club. This seemed to awaken a desire in Becky, a desire for her own cup photo. And thus began our quest: the Quest for the Stanley Cup. We went back to Becky's to get the bikes, and headed back up the Strand. We stopped again in Hermosa, where we went into Silvio's (where Becky knows everyone), chatted about the cup, and traded pictures and gossip. Then we got frozen yogurt. Yeeaahhhhh. We headed up to a little bar called The North End (where The Cup made an appearance the night of the final victory). We peeked in, and had decided we wouldn't stay when a voice called, "Becky!" As I said, she knows everyone in the South Bay. So we stayed for a bit and had a drink with her pal, Maria. While we were sitting there, an Australian gentleman (and I use the term loosely) came up and started chatting us up. He said, "First of all, you're all stunning, but I have to ask you: what's up with the fedora? My great-grandmother said never to trust a woman in a fedora." He said a lot of other things. He was pretty drunk, I think. Typical. It turned out to be a fortuitous meeting, however, because his country club was hosting The Cup the following night, and when he mentioned that, Becky decided to forgive his impertinent remarks about women in fedoras. Maria got a text saying The Cup was at Sharkeez in Manhattan Beach. This is when the chase really heated up. We biked to Manhattan Beach, and were walking up to the bar, only to realize it was Sharks Cove, not Sharkeez, so we got back on the bikes and headed further up the Strand to North Manhattan Beach. We walked into Sharkeez, and though it was immediately obvious that The Cup was not in residence, we asked the bartender about it. He explained that it had been in the Sharkeez in Hermosa at 11 am...when we were right there for the rally...Doh! So much for that. Luckily Becks had Aussie country club guy in her back pocket. Disappointed in our quest for The Cup, but spirits intact, we headed back to Becky's. Mildly sunburned on my left side, and legs sore from biking, I arrived home to K-town. Alex and I went out for sushi. It was so good, and so much better than our last sushi outing (which Alex says was comically bad. I say it's only funny because we didn't get sick). Back at my place, we planned on watching a movie, but we didn't even manage to pick one out before we fell asleep. Party animals.